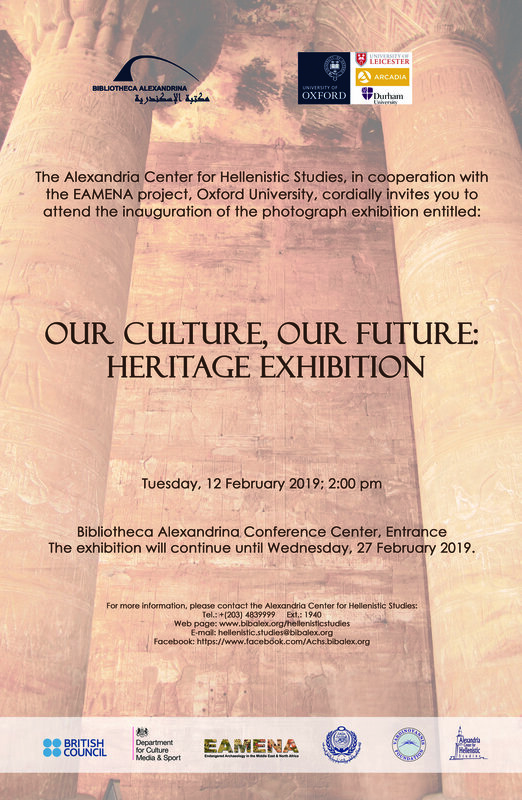 The Alexandria Center for Hellenistic Studies in cooperation with the EAMENA project, Oxford University at UK organize photograph exhibition entitled: “Our Culture, Our Future: Heritage Exhibition” at 2:00 pm on Tuesday 12 February 2019, at Bibliotheca Alexandrina, Conference Center, Entrance. The exhibition aims to increase awareness of the methods of archaeological documentation. It consists of twelve panels targeting specialists as well as the public at large.The display includes several panels revolving around the Archeology and Cultural Heritage in Egypt, in the Ancient Egyptian, Greco-Roman, Coptic and Islamic Periods. It also contains four panels presenting the natural threats that affect Heritage and archaeological sites. The panels illustrate examples of preservation and conservation projects that took place in some archaeological sites such as the Nubian Temples and Red Monastery. 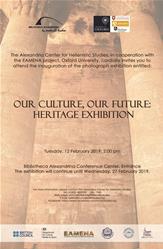 Moreover, the exhibition also includes four other panels that present the use of satellite imagery in identifying heritage and archaeological site in accordance with the training activities of the EAMENA project. The Exhibition is open for public until Wednesday, 27 February 2019.